Travelled from Manchester to Melbourne in December. 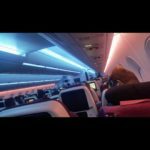 First time travelling with Qatar Airways was not disappointed. Our seats were very comfortable and the service was first class. Looking forward to our next trip with Qatar. Montreal Canada to Phnom Penh Cambodia. The service was more than I expected helpful crew. I had time to visit Doha at night during my transit. From Doha to Phnom Penh the flight was also agreeable but I was disappointed that no message was made for boarding. One hour before departure I started seeing people getting in line to embark. I waited until the last moment and mentioned to the Qatar staff that I didn't hear any announcement for boarding was that common practice? The staff member replied that they usually made an official announcement but this time they had not Besides that I really enjoyed flying Qatar Airways. We flew from CDG via DOH to JNB and couldn't have been happier! Food and service excellent. Very clean toilets. We didn't use the inflight entertainment and therefore can't comment. Bus ride from plane to terminal seemed to take forever. Premium Terminal hopelessly overcrowded when we got there without a single table for 2 in sight. Fortunately we didn't have a long transfer time on our way back to CDG and could almost board immediately. We will definitely continue to take Qatar Airways for all of our long distance flights even if it means changing planes in Doha instead of going direct. 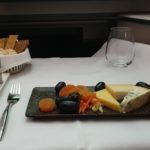 Not only is Business Class so much more affordable than other European airlines but it is simply so much better as well! Keep up the great service! 07/03/14 Manchester-Doha QR024. 08/03/14 Doha-Singapore QR944. 15/03/14 Singapore-Doha QR945 Doha- Manchester QR023. Agree with review left by S Lloyd. Doha transit not good. Bus to terminal - poor facilities in airport (went to Oryx lounge in the hope of a shower but advised 1.5 hr wait for towels). In-flight entertainment poor. Food awful. Been going to S'pore for many years I have used other airlines/routes which have given a better service. QR24 and QR940 18/19 Feb 2014 and return QR939 and QR21 on 1/2 March 2014. 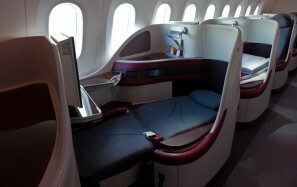 Recently flew Manchester-Doha- Singapore and was dissatisfied with the whole service. Flights outward and return were delayed. In Doha we were left in a holding area with approximately 100 other passengers with no ventilation air con or access to water in high temperatures with seats for only a dozen people whilst was waited for the nonsense of being bussed to our next flight. This happened on both the outward and return flights. Onboard staff were unfriendly and everything seemed too much trouble. Food was mediocre at best and repetitive. The entertainment system is outdated. I cannot recommend. DXB-DOH-BCN March 5th. Overall a not-too-bad flight experience but QR staff really showed disorganization and even lack of interest. DXB-DOH flight was a breeze. 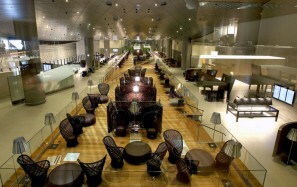 Transfer at Doha airport is obviously the same chaos Silver Privilege Club Lounge is quite grotty. DOH-BCN: A332 equipment totally disorganized cabin crew. Food was fair just fair. IFE very poor and repetitive. Arrival on-time at BCN airport baggage were delivered very quickly with PC priority respected. At least a fair value for money. 24/02 DOH-DPS on QR 944. 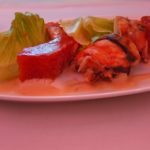 The airline provides a high level of service with a superb wine list and meal menus. The seat on the B777 is great better for me than the new 787 one as I never travel alone and always wanted a window seat. Crew were excellent except on the short SIN-DPS. Premium terminal at Doha is fine but crowded and without enough facilities. Flew for the first time with Qatar (CDG-DOH-MLE) and to be honest - I'm slightly disappointed. May be also my expectations were too high. Meals and wine cart are really very good. But the service is very slow. It's a real problem on the evening flight from Paris - it took almost 2 hours to have a dinner which is long as result - not much time to sleep. Seats are quit comfortable on A340 but not exceptional not comfortable at all on A321 (but it looks they will be replaced now). Transfer by buses in Doha is not an issue and Premium terminal is very big and provides a lot of place and different drinks and meals. What is strange: they don't serve champagne before take off in Paris but they do in Doha and in Male. I have traveled many times with Qatar Airways I am never disappointed and I feel their service is getting better. The last flights I had was from JKT-DOH DOH-ANK IST-DOH DOH-JKT. All staff were polite friendly responsive and helpful. For economy class the seats have more space than EK or EY. The only complaint is transferring at Doha was not as convenient as transferring in Abu Dhabi or Dubai. 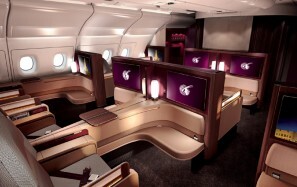 Travelled with Qatar 6 times now first 4 or so were great and was left impressed. The last few flights have seen a decrease in service. Having said that seats are comfortable in-flight entertainment is pretty good food is ok but doesn't seem to change often (if at all) and flight attendants really do depend - have had really great ones and have had rude ones. I find the service a big part of the overall rating. Would fly again but not before looking around. QATAR AIRWAYS, the national carrier of the State of Qatar, is one of the fastest growing airlines with a modern fleet of 179 aircraft flying to more than 150 key business and leisure destinations across six continents. Qatar Airways is a member of the oneworld global alliance. A380 aircraft provide 8 first class suites, in 1x2x1 cabin layout. Typical seat layout of 1x2x1 (eg. A380, A350, B787) or 2x2x2 layout (eg. B777). 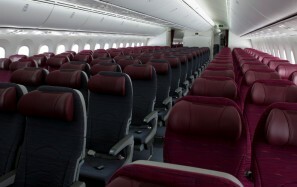 Qatar Airways aircraft cabin/seat layouts can be viewed on the Seat Map in menu below. 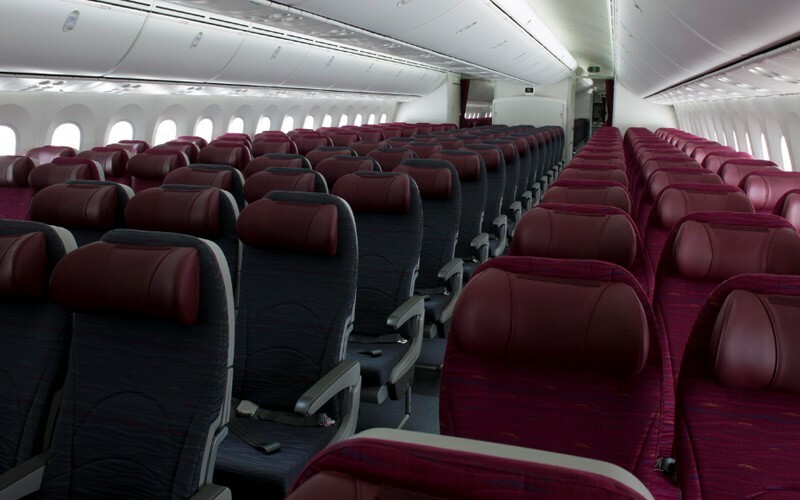 View aircraft seat maps for Qatar Airways fleet. We have provided you a direct link to Qatar Airways Fleet information page, where the most up-to-date information should be available. 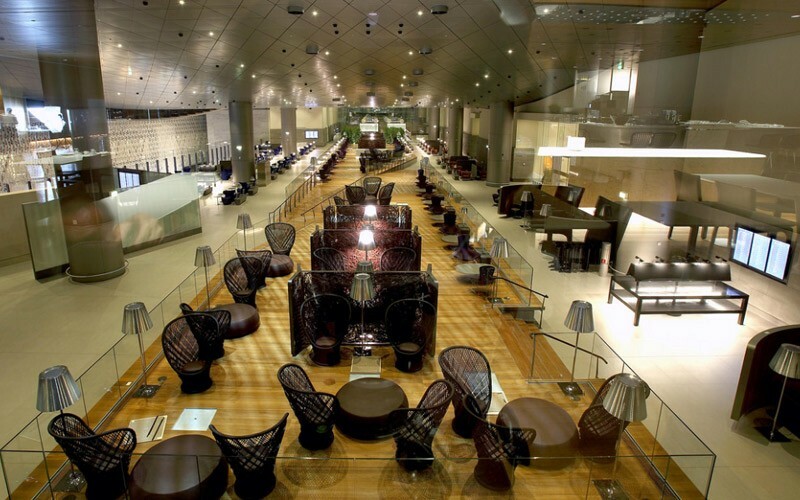 At Doha Hamad International Airport, premium customers may use the luxury Al Safwa First class and Al Mourjan Business class lounge. Qatar Airways recently launched Oryx One, an enhanced interface for its inflight entertainment system, increasing the number of movies and TV shows on board from 950 to up to 2,000. With the very first dual-screen interface, onboard A350, A380 and Boeing 787 aircraft, customers can multitask - like play a game on a handheld device as you wait for a movie to load on your personal screen. Stay connected with OnAir mobile service. WiFi services are available onboard Qatar Airways A380, A350, Boeing 787, A319 and selected A330, A320 and A321 aircraft. Qatar Airways was one of the first airlines named as a 5-Star Airline. 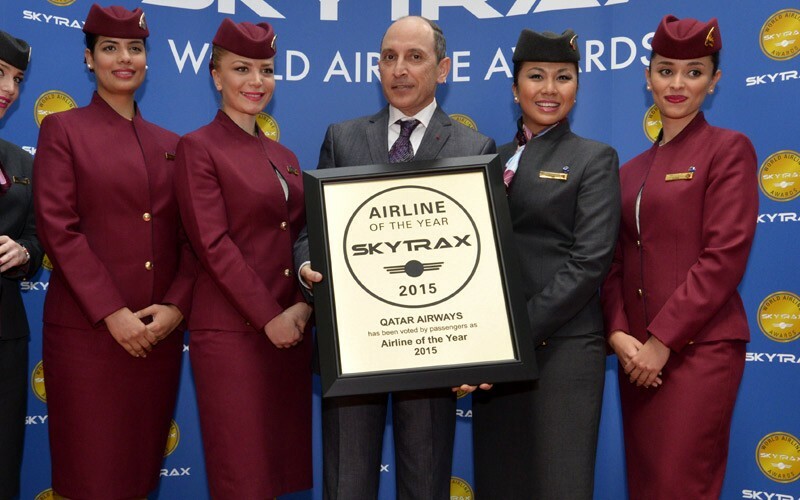 Qatar Airways won Airline of the Year, Best Business Class Airline Seat and Best Airline in the Middle East at the 2015 Skytrax World Airline Awards. 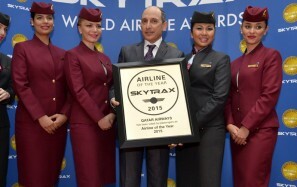 This is the third time Qatar Airways has won this prestigious and coveted accolade of Airline of the Year.